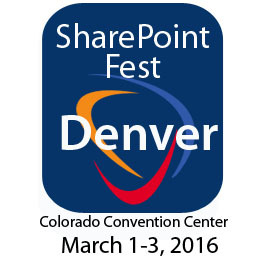 SharePoint Fest Denver announces CLM Matrix as a silver sponsor of the annual technology conference which will take place in Denver, Colorado at the Colorado Convention Center March 1-3, 2016. SharePoint Fest Denver to have CLM Matrix, the leading provider of solutions that transform the way companies manage contracts, trade agreements and other important documents that contain valuable strategic information, to be a silver sponsor of the annual technology conference. Conference delegates will hear from keynote speakers and attend breakout sessions. Over 70 sessions will be offered across multiple tracks, as well as an optional day of workshops preceding the conference. There will also be a networking reception held at the end of the first day of the conference. CLM Matrix is a Microsoft Gold Partner and a leading global innovator of SharePoint-based contract lifecycle management software products that transform the way organizations manage contracts, trade agreements and other important documents that contain valuable strategic information. CLM Matrix products are used by customers worldwide across more than 21 unique industry verticals to standardize, streamline and automate their document centric collaborative processes. The company focuses on building intuitive software that leverages and extends existing Microsoft Office/SharePoint technology in three key areas: enhanced rule and policy based workflow, dynamic server-side document generation and no-code configuration. CLM Matrix is headquartered in Dallas, Texas and maintains a global network of experienced deployment and support specialists.